Kathryn Selby’s fourth Selby & Friends tour for 2018, Tormented Souls, saw the return of well-known Friends violinist Natalie Chee (Concertmaster of the Radio Symphony Orchestra in Stuttgart but back home recently for concerts with the Australian World Orchestra, among others) and cellist Julian Smiles (of Goldner String Quartet and Australia Ensemble fame), in a concert of Beethoven, Schumann and Messiaen. This combination of musicians played Selby & Friends’ Proud Folk tour last year and once again they brought assured, masterful playing to City Recital Hall. The forbidding opening to Beethoven’s Kakadu variations – ten variations on a melody, Ich bin der Schneider Kakadu, by Wenzel Müller, belies the lighter variations at the centre of the work. It has been proposed that Beethoven may have written the darker, more complex introduction and final variation when the work was published in 1816, rather than when he first penned the variations in his youth. If the opening tempo bordered on ponderous, the variations themselves tripped along merrily – Selby’s timbre at the piano bell-like against the polished strings. The canon between violin and cello was a particular highlight, as was the reverent, almost ceremonial Adagio espressivo ninth variation. The trio followed Beethoven with Schumann – another tormented musician – and the third Piano Trio, dating from 1851, around the turbulent (but not unproductive) period following his move to Düsseldorf to take up the job as music director – which ended unhappily, and presaged the decline in health that would see him confined to an asylum in 1954. There is certainly turbulence in the music, Chee, Smiles and Selby passing ominous descending lines around the ensemble and delivering some beautiful fugato passages in the first movement. While the darkness continues in the second and third movements, the fourth movement brightens and the trio brought a folky, almost celebratory mood to the finale. 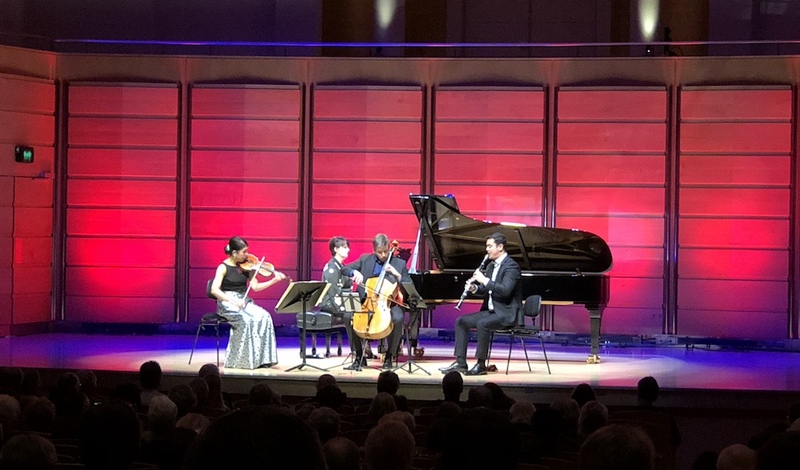 The second half of the concert saw clarinettist Lloyd Van’t Hoff – winner of the 2015 ABC Symphony Australia Young Performer of the Year Award and clarinettist in Arcadia Winds – join the trio for one of the masterpieces of 20th century chamber music, Messiaen’s Quartet for the End of Time. Composed, famously, in the German prisoner of war camp Stalag VIII-A the work is infused with Messiaen’s strong Catholic faith, love of bird-song, synaesthesia, rhythmic experimentation and the apocalyptic visions of the Book of Revelations. Led by Van’t Hoff’s clarinet, the opening Liturgy of Cristal was gentle before the thunder of the second movement, Vocalise, for the Angel Who Announces the End of Time, which featured, once the storm subsided, moments of finely spun strings over glimmering piano. Van’t Hoff’s Abyss of the Birds – the monumental clarinet solo at the heart of the work – was deftly crafted, his smooth, spacious lines emerging from silence and fading back into the void. Physically, Van’t Hoff didn’t quite capture the stillness required to stop time completely (though his movements didn’t affect the sound itself) and for me it is still Paul Dean’s Abyss on tour for the Australian Chamber Orchestra in 2012 that remains the benchmark, wedding both the musicality and theatre of the piece. There were nonetheless some wonderful moments: the long crescendo out of nothing before the first flurry of birdsong was spectacular and the echoed passages were particularly exquisite. Smiles’ polished solo in Eulogy to the Eternity of Jesus, over warm, salon chords from Selby, was another highlight, the build-up in intensity crafted in such finely graded increments it was almost imperceptible in any given moment, yet ultimately incredibly potent – the musical equivalent of the boiling frog fable. While an iPad malfunction derailed the Furious Dance for the Seven Trumpets, the final movement, Praise to the Immortality of Jesus, was absolutely stunning – Chee’s ethereal, winding ascent was enough to make your hairs stand on end.